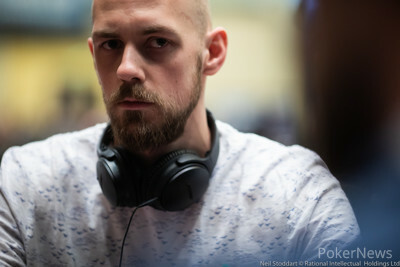 After a hectic day of seat changes, all-ins and calls, Timothy Adams could be crowned as the winner of the $50,000 Single-Day High Roller here at the 2019 PokerStars Caribbean Adventure in the Atlantis Resort. Adams defeated Stephen Chidwick heads-up with a joker and took home $372,508 and the famous PokerStars Spade for his efforts today. The tournament attracted 26 entries in total which included eight reentries, creating a total prize pool of $1,274,130. Five players were in the money but eight would be playing on the Final Table which included Alex Foxen, Justin Bonomo, PokerStars Team Pro Igor Kurganov, Matthias Eibinger, Talal Shakerchi, and Dominik Nitsche. The tournament was originally billed as a $100,000 Single-Day Super High Roller and slated to start at 12:30 local time according to the latest version of the schedule but that was soon changed as only two players were registered at that time. The high rollers discussed among themselves on how the structure of the tournament should look like and in the end, they came to the agreement to change a few things. The buy-in of the tournament was reduced to $50,000, the level duration was shortened to 20 minutes each, and instead of unlimited reentries, players could only do one single reentry during the first ten levels of the day. Around 3:15 PM, the tournament finally got underway with twelve players in their seats. Steve O’Dwyer was the first to be eliminated when he shoved his queen-seven on the river of the ace-ten-five-deuce-king board and was called by Foxen who held ace-nine. Kurganov was the second player to be sent back to the registration desk when Nitsche managed to river a flush to take the PokerStars Team Pro out. Today seemed to be a day of double knockouts, Chidwick eliminated Isaac Haxton and Seth Davies in the same hand with ace-ten with the former holding king-queen and the latter had pocket fives. The ten on the flop gave Chidwick the upper hand to take them both out. Davies wouldn’t return but Haxton did try again. In Level 10, Shakerchi got his last chips in with queen-jack but got no help of the board against the pocket sevens of Kurganov. Christoph Vogelsang was also eliminated in the same level and had to reenter like Shakerchi. The dubious honor of the last reentry of the day goes to Mikita Badziakouski in a huge hand against Foxen. Badziakouski has called the three-bet of Foxen preflop and check-called on the flop and turn. The river completed the deuce-deuce-eight-six board with the seven of spades to complete the flush draw and now Badziakouski check-tank-called Foxen’s shove which had him covered. Foxen held the flush indeed which beat the two pair Badziakouski had flopped. Shakerchi’s second bullet seemed to hold up better than Haxton’s as he cracked Haxton’s aces with pocket tens on the river. Cary Katz was next to go when his ace-king couldn’t beat Foxen’s queens. Badziakouski’s second attempt at winning the tournament was cut short when he ran his ace-deuce into the ace-jack of Vogelsang. But Vogelsang’s run didn’t last much longer either as Kurganov eliminated him when he defended his big blind when Vogelsang had raised. On the eight-six-trey flop, it all went in as Vogelsang has flopped top pair with ace-eight. Kurganov held ten-deuce and managed to make a straight with the four on the turn and the five on the river. Bryn Kenney shoved and lost it all when he was called by Bonomo who held ace-nine on the ace-ace-trey-jack-ten runout. Daniel Dvoress lost most of his stack in a blind versus blind battle against Kurganov and then lost his last five big blinds to Kurganov. Nick Petrangelo had shoved six big blinds with queen-seven and was trying to beat Bonomo’s ten-eight but Bonomo managed to turn a pair of eights. At the same exact time, O’Dwyer was all-in with king-queen and called by Kurganov with ace-queen. They both flopped queens but Kurganov’s kicker meant that suddenly there were only eight players left for the final table. 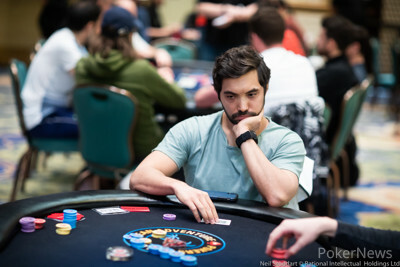 Nitsche was first to leave the final table stage when Matthias Eibinger shoved in the small blind and Nitsche called with a stack of only 5,000 fewer chips. Eibinger held ace-queen while Nitsche was sitting with king-nine and the higher hole cards for Eibinger meant the end of Nitsche’s tournament life. The bubble burst thanks to another double bustout when Shakerchi shoved, as did Foxen with the slightly bigger stack. Chidwick decided to put in all his big chips to also put Eibinger at risk as the last to act. After tanking for just over three minutes, Eibinger called. Shakerchi’s ace-jack and Eibinger’s ace-nine couldn’t win against Foxen’s pocket eights or Chidwick’s deuces on the nine-five-ten-eight-deuce board. With five players left, Kurganov was eliminated five minutes after the money was reached. Kurganov’s ace-king couldn’t take down Chidwick’s queens even though he had flopped two pair, the queen on the river gave Chidwick a set for Kurganov to go to the payout desk to collect $121,040. The final double bustout happened another five minutes later when Bonomo shoved for less than ten big blinds with king-eight, Foxen jammed almost fifteen big blinds with king-nine, and Chidwick called them both with ace-jack. 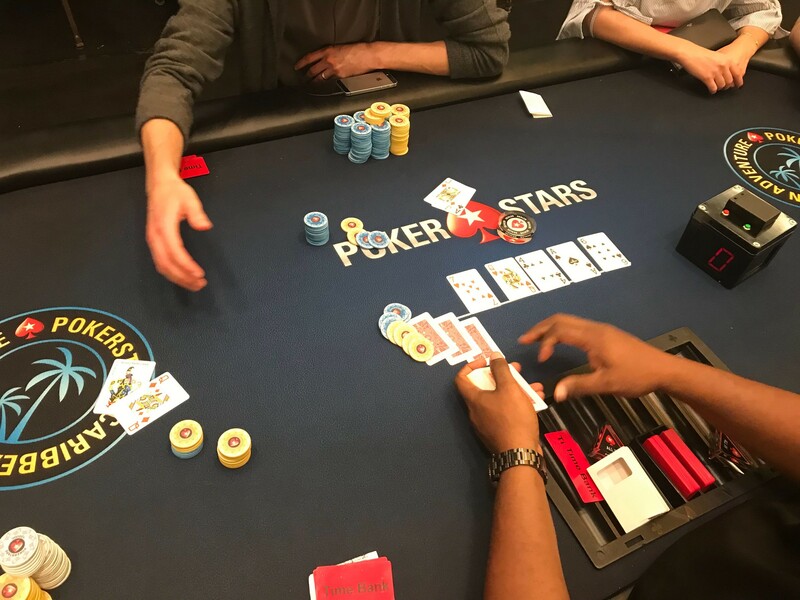 Chidwick flopped a pair of jacks but then hit runner-runner for the flush to eliminate both of his opponents to suddenly go heads-up against Adams. As soon as Adams and Chidwick were heads-up, Adams looked at Chidwick. “Are you thinking, what I’m thinking?” Chidwick asked Adams and Adams smiled. The floor was called over and they asked if they were allowed to add two jokers to the deck. The floor checked with the tournament director and in the meanwhile, they would continue playing heads-up. When the floor and tournament director returned, the tournament clock was paused and two jokers were added to the deck. This also seemed the perfect opportunity to look at numbers and a deal was agreed upon. Chidwick had a big chip lead so was guaranteed $423,822 while Adams would take $350,978. $21,530 and the trophy would be left to play for. Adams managed to double up immediately with ace-five of clubs against Chidwick’s ace-seven and turned a flush. 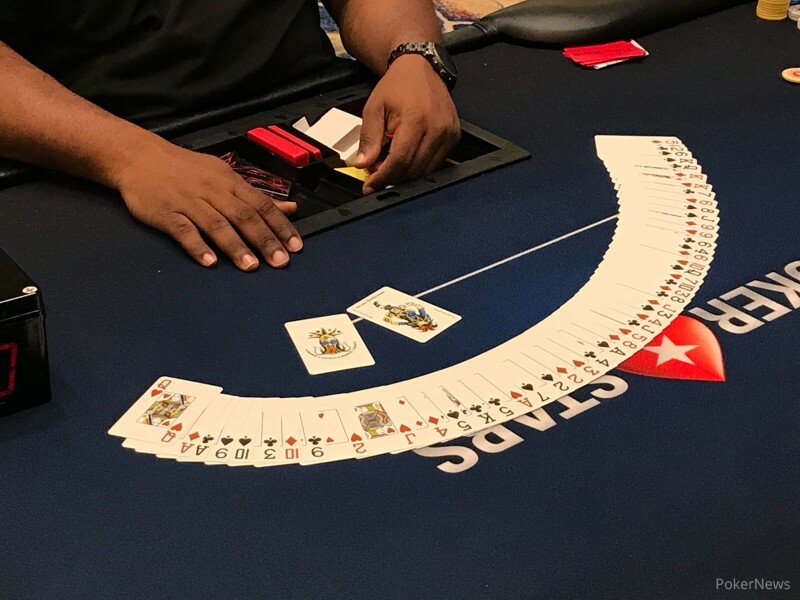 One of the jokers in the deck appeared on the board after about 40 minutes of play and Adams won that hand with another flush. Two hands later, Chidwick doubled with pocket kings against Adams’ ace-king. And then in the final hand of the night, Chidwick shoved and got snap-called by Adams who held the joker in his hand with a queen. Chidwick had ace-jack and behind by a lot. The board ran out seven-queen-four-ace-six for Adams to be crowned as the winner with a set of queens thanks to the joker! This was the last $50,000 Single-Day High Roller coverage for the PokerNews live reporting team but there is a $25,000 Single-Day High Roller scheduled for tomorrow, Sunday, January 13 from 3 pm local time onwards so make sure to return for more High Roller updates! Stephen Chidwick shoved on the button for 1,800,000 and Timothy Adams snap-called. With the joker in Adams' hand, Adams was ahead by a mile probably. The board ran out for Adams to have a set of queens by using the joker as an extra queen. Chidwick and Adams shook hands and made their way to the payout desk to collect their winnings. Adams will claim the extra $21,530 and the PokerStars spade for the win. A full recap of today's action is to follow. Timothy Adams called on the button and Stephen Chidwick opted to check. The flop came , Chidwick check-called the 120,000 bet of Adams. The turn brought them the , now Chidwick check-called the 475,000 continuation-bet of Adams. Chidwick checked for the last time when the river completed the board with the . Adams barreled a bet of 1,900,000 over the line after using a time bank card and Chidwick folded after considering it for a bit. Timothy Adams called on the button and Stephen Chidwick raised to 350,000 which Adams called. They both checked through the on the flop to the on the turn. Chidwick bet 275,000 and Adams called. The river completed the board with the , Chidwick checked, Adams decided to bet 950,000 using a time bank card. Chidwick called but mucked when Adams turned around for the two pair of jacks and eights. Stephen Chidwick was all-in for 2,065,000 from the button and at risk as he was covered by Timothy Adams. The board ran out for Chidwick's pocket Kings to hold and double him up. Stephen Chidwick called on the button and Timothy Adams opted to check. The flop came with the first joker since they had been added to the deck. Adams checked and Chidwick bet 100,000. Adams used a time bank card before making the call. The turn was the , Adams checked again and now Chidwick fired a bet of 350,000 into the pot. Adams took a few seconds and then made the call again. The river completed the board with the and they both checked through it for Adams to pick up the pot with for the nut-flush as the joker could be used as the . Adams check-called the 160,000 bet of Chidwick on the flop. They both checked through the on the turn to the on the river. Adams now bet 500,000 which sent Chidwick into the tank, using two time bank cards, before making the call. Adams tabled for trip nines and that was enough to make Chidwick muck.